A blender for blending the coconuts. My blender has 850W power and it can blend pieces of coconut very well. I have also used a 600W blender in the past (and recently a 500W blender) with great results. You can also grind it in the market but make sure they clean their machine very well before using it to blend the coconut for you. Chopping board for cutting the coconut flesh/meat. A blunt object for breaking the coconut: a hammer or small axe will do. Original stainless steel pot for cooking the coconut till the oil seeps out. Do not use non-stick or coated pots for this because during cooking, the coconut oil will get to high temperatures. Hot water mixed to a comfortable temperature. Keep it as hot as you can comfortably handle with your bare hands. Extracting coconut milk with moderately hot water gives you more coconut oil than when you extract with warm or lukewarm water. Don’t even use cool water. If you can, it is better to watch the video below for the procedure. Break the coconuts with a heavy blunt object. When done, pry out the coconut meat from the coconut shell with a knife. Once the coconut is mature, the coconut meat should come out of the shell easily. For best results, we need to blend the coconuts with warm water. So boil some water and mix with cool water to get warm water. Grind the pieces of coconut with the diluted hot water till smooth. Depending on the quantity you are making, you may need to grind in batches. Pour in a sieve to separate the coconut milk from the chaff. Then press with your hands to squeeze out the last drop. 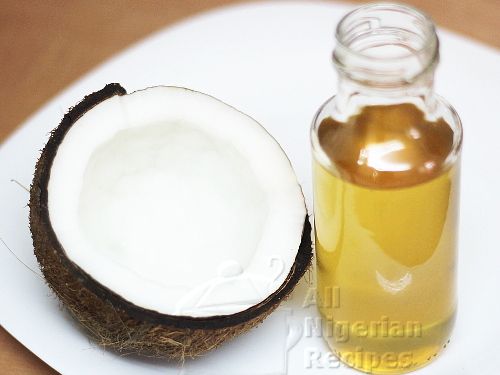 Take the caked white coconut oil and place in a clean dry stainless steel pot. 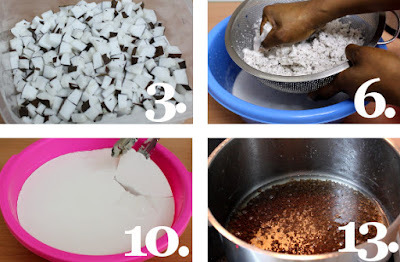 The water remaining in the bowl still has some coconut taste and can be used to boil White Rice, prepare Jollof Coconut Rice, White Coconut Rice and any other recipe that calls for coconut milk. Keep an eye on the pot and stir from time to time. Cook till you notice some charred coconut bits in the oil. I cooked the one in the video below for 1 hour 15 minutes. Sieve with a chiffon cloth or a cheese cloth to remove the charred bits. If you still notice any charred bits in the sieved coconut oil, sieve again with a paper towel. Store in your cupboard and use when you wish. That’s it! Use coconut oil for cooking, for your hair and body. Google for other uses of coconut oil.